Raja Muhamad Asyraf graduated from the cohort 4 of the TNTA programme and is currently a Third Officer with Maersk Tankers. Asyraf got to know more about the TNTA programme through the newspapers. 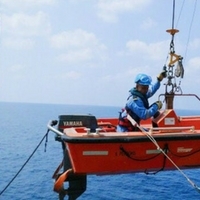 He was inspired by his father who was a seafarer for 14 years and this prompted him to follow in his father’s footstep. Asyraf felt that the TNTA programme has provided another avenue for him to sail. Though he studied for a different diploma in polytechnic, he felt that the three years in the TNTA programme was well spent and he would not trade his experiences with his previous career choice. The course has widened his career options and enhances his understanding about the maritime industry. Asyraf’s hard work and commitment has paid off when he received the ‘Best Cadet Award’ upon graduation. Asyraf aspires to get his CoC 1 and become a Captain one day. He may also join management position on shore in future. Asyraf enjoys the mini parties held onboard the ship as it helped him to bond with his shipmates of different nationalities. He also looks forward to exploring new places during his shore leave. It was challenging at first to communicate with Captains of different nationalities and familiarise with their work etiquette. However, Asyraf has learnt that the key to working efficiently as a team is to make an effort to listen and understand the problems of his shipmates. In order to have a balance lifestyle onboard the ship, it is vital to have a good time management between assignments, duties and practical training. Asyraf shared that sailing onboard a vessel is unlike a cruise trip where entertainment and fun can be found easily. Loneliness and boredom could strike while sailing and he has to maintain a proper schedule constantly with a balance of work and leisure activities to keep his mind healthy. With almost three years of sea services as an officer, Asyraf feels that he has grown to become a more responsible and independent individual, whom his crew looks up to as a role model.